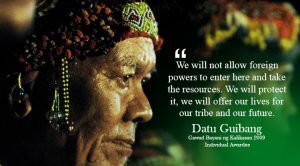 In 1993, Datu Guibang Apoga founded the indigenous people organization Salugpungan Ta Tanu Igkanugon (Salugpongan), which means “unity in defense of the ancestral domain.” It was organized with several other Talaingod Manobo leaders to oppose the logging operations of Alsons in Talaingod. Their resistance made their 19,000 hectares ancestral lands, protected from the commercial logging. Datu Guibang Apoga was one of the ten awardees of the Gawad Bayani ng Kalikasan Awards in December 2009. Currently, Datu Guibang experiences the harassment of the 56th Infantry Battalion and paramilitary group Almara. According to Pasaka (Confederation of Lumad Organizations), the datu was in need of healing from an ailment and was recovering in the community of Nasilaban, Talaingod, Davao del Norte. This was taken advantage by the military and two soldiers forced him to surrender. As of June 22, 2018, according to Governor Anthony del Rosario of Davao del Norte, Datu Apoga surrendered because he had gotten tired of conflict because of old age. With his surrender, the provincial government handed over livelihood assistance to Apoga and around 20 surrenderees, with Apoga himself receiving a wheelchair from the government. Under the Duterte government, areas covered by Salugpongan Ta Tanu Igkanugon experiences heavy military operations conducted by the three battalions, the 72nd IB, 56th IB and 88th IB. Their occurrence led the rise of human rights violations such as accused lumad are forced to surrender as members of the New People’s Army, threatening them in community meetings, enticing them to surrender NPAs for money as bounty, encampment in schools and houses.